I’ll give you a minute. It’s ok, I about took a knee when he told me that’s what he wanted. What in the heavens? Is this some sort of joke? A waterbed?! Do the 1970s somehow come with it? Do I need to buy him a lava lamp and shag carpet as well? I’m sure you’re wondering his reasoning behind wanting a waterbed as was I when he told me. After he told me why he wanted it, I COMPLETELY understood. 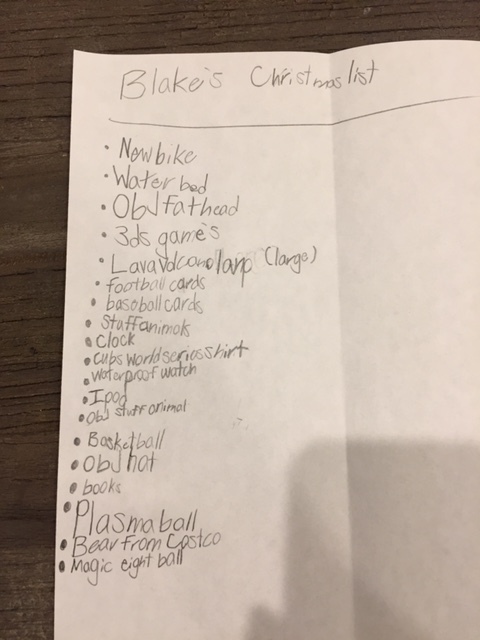 Waterbed= Yes, Blake, there is a Santa Claus! No waterbed= My parents are lying liars and they deserve to have their pants catch on fire. A waterbed for Blake would be like most other Christmas gifts he receives: it’ll be awesome for a hot minute then he won’t care about it anymore. Or worse, he’ll pop a hole in the thing and we’ll really be up a creek. Literally. I know Blake, and I know he’ll be disappointed when he comes downstairs to find no waterbed but seriously, I just can’t. He’ll get over it, right? If he grows up and wants to buy his own waterbed, more power to him. Then maybe his wife can be the bad guy and tell him there’s no way she’s sleeping on a waterbed. Good girl. Anyone have any suggestions on a good substitute for a waterbed? Is there another substitute other than, well…a regular bed? Maybe I’ll just give him a lava lamp and call it a day. He’ll think a lava lamp is totally groovy. A lava lamp. Large. I didn't even know there were different sizes. It's like he was born in the wrong decade.